I like simple things. My tri bike is an old standard double-diamond frame (though it's titanium), I time my runs with the regular old start/stop functions on a digital watch (and then I'll map it on the Route Tracker on BeginnerTriathlete.com if I want to know how far I went), only my most recent cell phone has a camera, and I finally entered the 21st century with texting in 2008... My shoes are getting simpler as well. I like the Nathan pack for several reasons -- it's stable, puts the bottle at an angle so there's less sloshing, and it's easy to grab the bottle and slide it out. Strategically placed elastic cords can be strapped onto the top of the bottle to keep it in place, but I've never, ever had a problem with the bottle creeping out. Also, I can use any standard bike water bottle -- the bottle that it came with used a soft rubber stopper, which was nice on the teeth but had a tendency to tear (thank the kids for that one). The sleeve that holds the bottle is foam insulated, so a cold bottle won't cause your back to cramp up, and a hot back won't make your favorite drink into a tepid immitation of chicken broth.Refilling is as simple as refilling the bottle, no need to pull out a big bladder or risk getting the whole pack wet. The reflective stripe on the back, with two reflective "strap keepers" in front will help alert drivers for those who run on the roads in the dark. The triangular pocket is just big enough for a Gu and a key. Minimalism at its utilitarian best. Since I got mine, they've added an ID pocket with a waterproof ID card. Always a good idea to have ID of some kind with you. 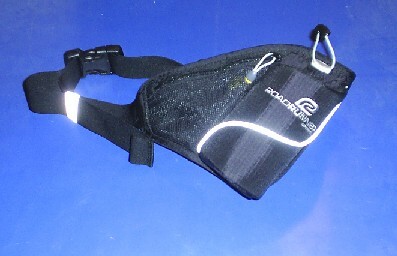 I've got a little fanny pack for carrying my cell phone and house key when I'm running shorter distances. My wife insists it a fashion throw-back to the 80's... She refuses to let me wear it when she's with me. She's never said anything like that about the Nathan water pack. I picked this one as an opportunistic purchase at the local Road Runner Sports store (Kent, WA) some 3 years ago, and I've been glad I did. It looks as good now as the day I bought it. Simple things that do the job with aplomb. 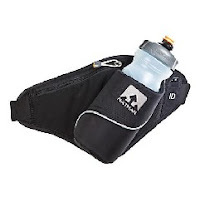 The Nathan Triangle Hydration Pack fits that category to a tee.